Okay, so I gave in to these two. While I was shopping for some family clothing basics at the community mall the other day, I thought I'd give their Toys 'R Us a "pass-by". Small, hole-in-the-wall community malls have this reputation for not having a lot of shoppers, thus I thought they might have the girls I was wanting. Turned out, they had Joyce, but no LA girl huhuhu... Oh well, I got Neko anyways so I was the happy camper bringing home these two. I have been on the fences with this lady since her release maybe because I already have a shiny black-haired, porcelain-skinned Asian gal in my collection, albeit a Dynamite Girl. I have always wanted my girls to each have unique looks to them. Then when she got first released, collectors were raving about her! Double whammy - I'm quite a jealous gal so if everybody wants something, I lose interest in that thing in a snap. But what got me excited is that she is Japanese! Aya, Shiori and Kei would be happy to welcome her so they organize a sleepover and make takoyaki balls sometime. Tee hee... I'll call her Yoko then because I love Yoko (and John). Alrighty! Then, Joyce. Sigh, I am just really a sucker for girls with big, bright, lovely eyes - aren't we all? I feel like she's the ultimate buddy when you want to stroll around a small Spanish or Italian town. A girl-next-door, down-to-earth babe, simply-elegant, think-of-anything-nice-to-describe-her-then-add-dashes-in-between-words kinda girl. In short, I've always wanted her. LOL. I got them at discounted prices, albeit not the lowest I have heard over from the doll grapevine. 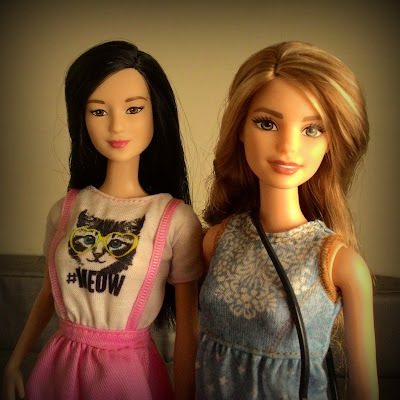 This isn't really meant to be a review as these gals have been released a long ago (in the collecting world, every second you miss a doll is equivalent to a day!) and a lot of collectors have already done the job well. So I'm just gonna share what I thought about them. 1. Face Sculpt. They're definitely new in my collection so I'm happy to add them in. I didn't know I'd be smitten by Neko/Yoko but now, I can't help but be pleased when I look at that very calming face. As for Joyce/Chiara, I'm so gaga over the dimples, and her grayish brown eyes, sigh. 2. Hair. I love the appropriate softness and thickness of both gals' hair! I found out Neko/Yoko has this dark brown shine to her very dark hair and I love that it is not pure black. Joyce/Chiara's light brown hair with blonde streaks feel like home, so relaxing to look at. 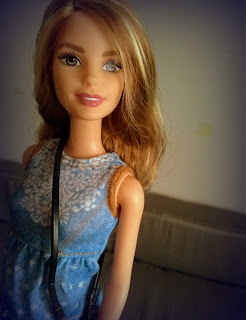 I see myself cutting Chiara's hair to a short bob, but given that I have already made her my sort of Barbie version of Chiara Ferragni, I might just buy another Joyce and make her a short-haired twin. I got that idea from an IG doll friend the other day. What an awesome excuse to buy two same dolls! 3. Poseablity. Although I'm for articulated bodies, I may keep Yoko's body for a while because with her rather edgy pose, she's perfect for edgy street-style clothing. It must be a new pose, but I don't know. I like what the retail-box default pose does, with her left leg way on the front, her hips swayed more to the right, and her right hand perfect for inserting into my denim shorts! It's like she inherited some poses from her Barbie Basics cousins! I'm excited to take her outdoors as she seems to look like she's ready for some brisk walking haha! Chiara has one of those typical Fashionista poses, and may not do more other than brush her hair with her right hand, which I try as much as possible to avoid when photographing my dolls. That body may be just used as mannequin or dress form for me. 4. Skin tone. Neko/Yoko's pale skin tone can sometimes look bland, but with the right clothes and colors, she'll be perfect. 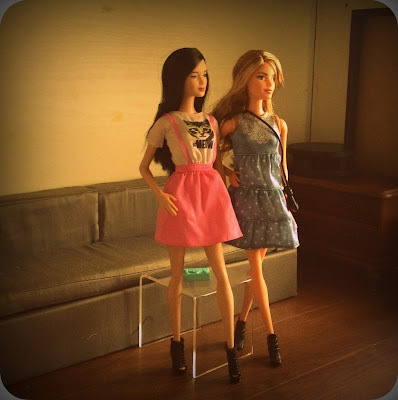 Joyce/Chiara, whom I rebodied recently, is perfect for borrowing Bree's body (Racquelle Barbie Fashionista). 5. Outfits. I'm in love with the "denim" dress of Chiara, but I may let the pink Meow dress go, as well as both the plastic bags and necklace. The booties, I'm keeping for the time being - but I have way too much black booties I may repaint these in the future. That's all I got to say as an excuse for my impulsive buying. 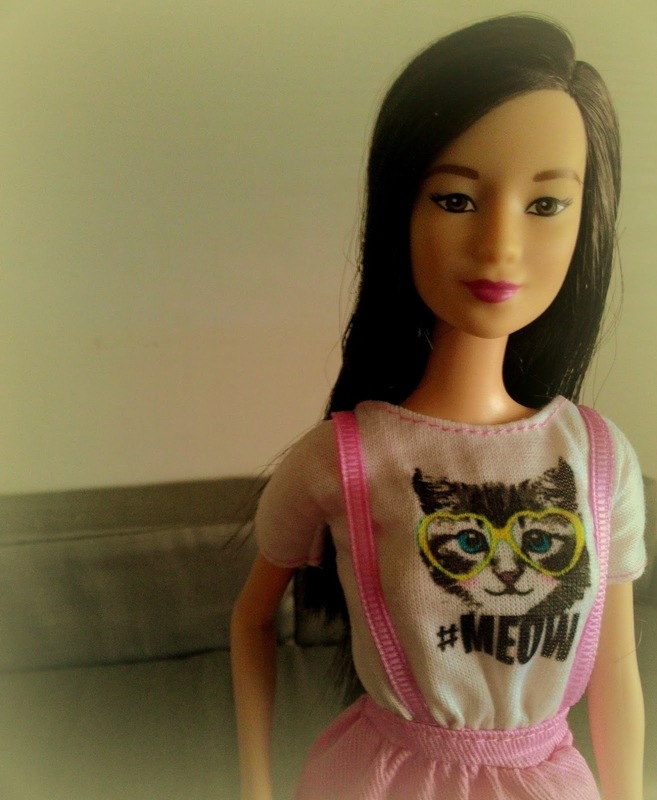 Aren't new doll posts meant to be excuses? Ha ha ha! Kidding aside, I gotta go for now and I hope you enjoyed this post. I'm off to take photos of my holidays diorama that I've been wanting to make for soooooooooooo long! Will share with you guys when they're ready! Enjoy the weekend! Thanks so so much, Marta... They are really pretty, I agree.. Can't get enough of taking pictures of them! Both are gorgeous dolls and I am glad you have them. Sometimes the wait is worth it. They will make great models too. Also, you won the Blog's Giveaway too! Whenever you get a chance email. OMGEEEE! Thank you so much, Brini!!! Finally, I won one of your generous giveaways!!! Thanks so so much, dear! Such a pleasant surprise and and wonderful gift this holiday's season!!! Thanks so much, Brins! Heading to your blog now ---- weeeeeeee! Hello! I love them, specially Joyce. Hugs!